PALS 2011 Schedule is up! TIP: Right-click, and Save Image As to download the PALS 2011 Schedule for quick reference! We’re off to a good running start, many thanks to Sup’Air for exclusively designing our field layouts! 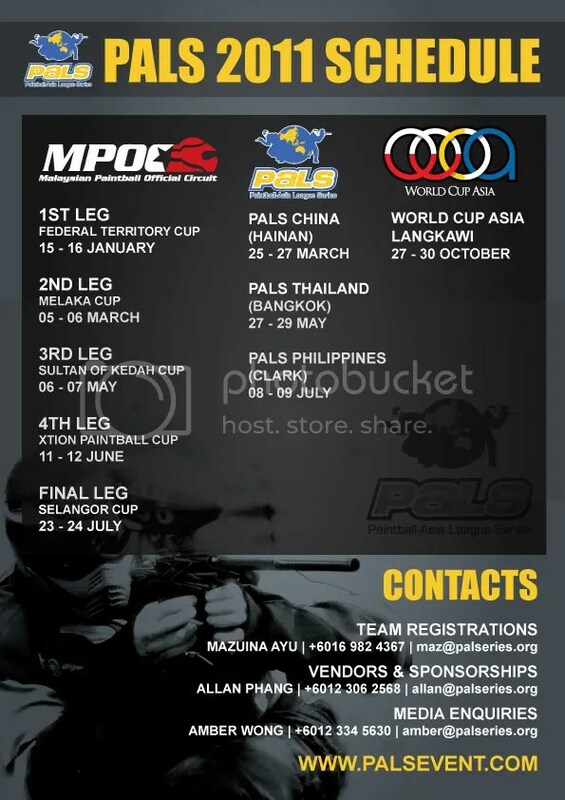 Visit our Registration Page to find out how to enter your team for the 5th Leg of the MPOC. Please also note that we’ve heard some concerns about the rulebooks having some discrepancies, so we’ll be releasing the newly updated rulebooks very soon! Please do check back within the next day or two. A ROYAL STEP FOR PAINTBALL! PALS is extremely proud to announce that Her Royal Highness, the Princess of Kedah (Malaysia), will be the Royal Guest of Honor for the World Cup Asia 2010, which will be held on 25th-28th November in Kuala Lumpur, Malaysia. YTM Dato' Seri Tunku Puteri Intan Safinaz Binti KDYMM Tuanku Sultan Haji Abdul Halim Mu'adzam Shah. PUTERI TUNKU PANGLIMA BESAR NEGERI KEDAH DARUL AMAN. This is a truly momentous occasion for paintball, as Her Highness is a strong supporter of the sport, and we are truly blessed to have her gracing this event. The first woman in Malaysia to ever be awarded the rank of Brigadier General for her contribution to the Wataniah Military Regiment, Her Highness has always been active in supporting sports and charity. Known for her compassion and generosity, the Princess is currently the chairperson for the Yayasan Sultanah Bahiyah, a charity organization for the state of Kedah, and hosted the Sultan of Kedah Cup alongside her father, the HRH Sultan of Kedah earlier this year. In addition being the Royal Guest of Honor for the WCA this year, Her Royal Highness will also be the Royal Patron for the World Cup Asia 2011, which we promise, will be truly ground-breaking, and an event no paintballer should miss! Find out more about the Yayasan Sultanah Bahiyah and HRH Princess of Kedah on Facebook or at their official website.